Sola wind flowing from the indicated coronal hole should reach Earth on Sept. 9-10. . Credit: SDO/AIA. 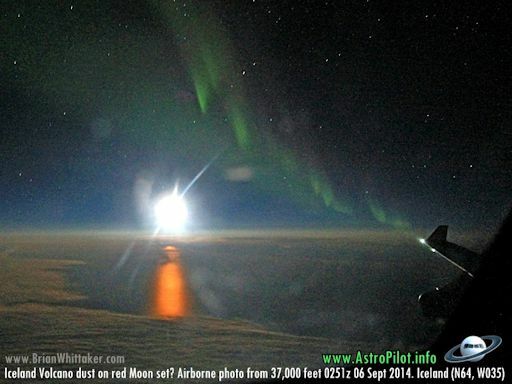 VOLCANIC MOONSET + AURORAS: A few days ago, pilot Brian Whittaker was flying over Iceland when he saw a strange plume poking through the cloudtops. "It was the active fissure eruption of Holuhraun associated with the nearby Bardarbunga Volcano," he explains. "Air traffic control reported it actively erupting to the north of the giant Vatnajokull Glacier and Grimsvotn Volcano which closed European airspace back in 2011." "About 500 miles southwest of Iceland I recognized a much redder then usual Moon set, especially with its reflection upon the ocean below," he says. "I strongly suspect that it was caused by the recent releases of volcanic dust and aerosols from Iceland." At closest approach on Sept. 9th, 2002 CE26 will be 18.4 million km (0.123 AU) from Earth. That is relatively far away, but because of the asteroid's large size, it is still possible to obtain meaningful data from the flyby. NASA astronomers will be pinging the system using the Goldstone radar in the Mojave desert. The Goldstone team says "we should be able to get coarse-resolution images of the primary. Echoes from the secondary will be weak and on the edge of detectability." There is no danger of a collision with Earth. Asteroid 2014 RC was discovered on the night of August 31 by the Catalina Sky Survey near Tucson, Arizona, and independently detected the next night by the Pan-STARRS 1 telescope, located on the summit of Haleakalā on Maui, Hawaii. 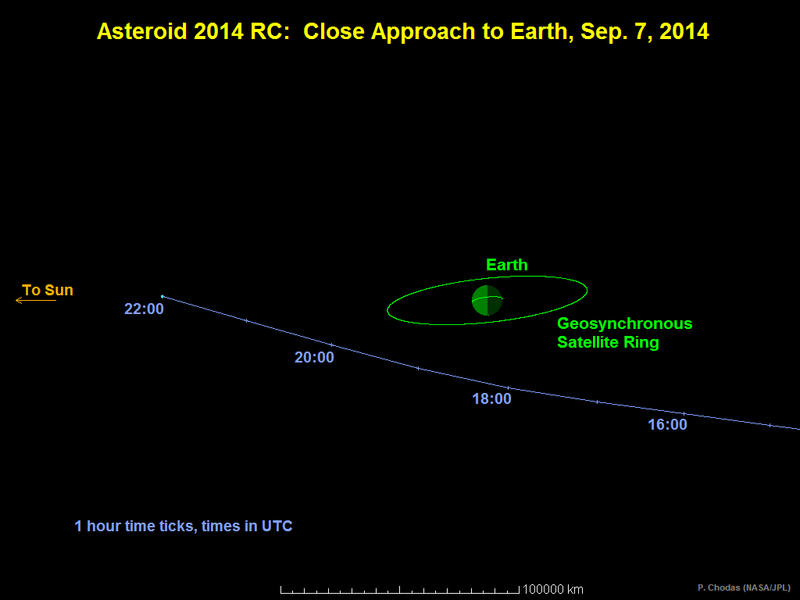 Follow-up observations quickly confirmed the orbit of 2014 RC: it comes from just beyond the orbit of Mars. According to NASA, "[the orbit of 2014 RC] will bring it back to our planet's neighborhood in the future. The asteroid's future motion will be closely monitored, but no future threatening Earth encounters have been identified." On Sep. 6, 2014, the network reported 68 fireballs. On September 6, 2014 there were potentially hazardous asteroids.